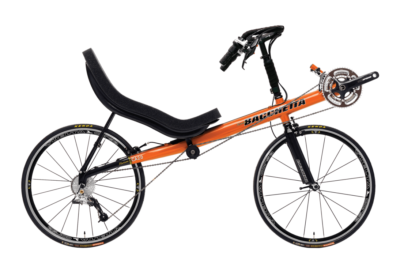 The Bacchetta Corsa defines the modern short wheelbase performance recumbent. 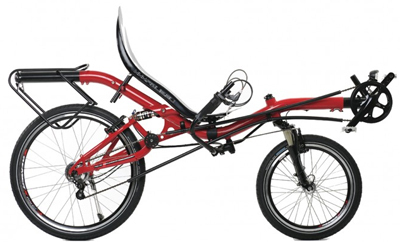 It is reasonably priced with an aluminum frame and a variety of components. The Corsa is Bacchetta’s aluminum framed high racer with road bike parts, including a carbon fork and lightweight wheels. It also has more narrow handlebars than other Bacchettas for better aerodynamics. The steering riser is fixed for weight savings. 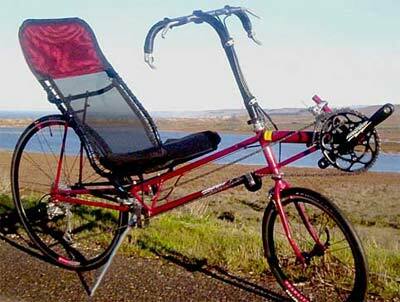 If you want a recumbent road bike but want to keep the price reasonable, look here. The Corsa is available in a variety of wheel sizes, depending on your needs. We normally stock the Corsa A70 with 700C road bike wheels, allowing for a wide variety of tire choices. We can also supply the Corsa A65 with smaller 650C wheels if the 700C models sits you a little too high. Bear in mind the limited tire selection for 650C wheels. Some years back, triathletes who didn’t want as high gears as road bikes preferred 650C wheels, being a bit smaller. (Remember these folks also had lots of running and swimming to do.) With the development of compact cranksets many tri bikes went back to 700C wheels. So 650C is a bit of an anachronism. The upshot? Get 700C if you can. If you want to drop the seat about 2 inches then get the 650C. We’re only listing spec info on the A70 below. 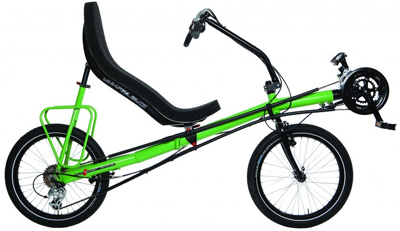 Arguably the best selling performance recumbent of all time, the Corsa now takes another leap forward. The new Corsa A70 keeps the Corsa’s legendary performance, but now lets you add another layer of versatility with it’s new Adroit dropout system. Easily swap between your lightest most aero road wheels, right into a set of rugged touring wheels within a matter of minutes. The Corsa continues to be the industry standard! Check out the complete component package for the Corsa, ride one for yourself and you’ll very quickly see why all of the other Corsa riders on the road have just two words for their recumbent cycling brothers: See ya! Bacchetta Custom Ovalized Aluminum w/Disc Brake Tab and Adroit Dropouts - The light and stiff frame that Bacchetta specializes in. This gives great flexibility in what kind of brakes and wheels that you use. Fork Bacchetta Carbon Johnson 700c - So we called Bacchetta and asked just what is a "Carbon Johnson" fork, and is it OK to discuss it in front of the ladies? It appears that "Carbon" Johnson is the engineer who makes them, along with other carbon fiber thingies. We weren't in a big hurry to find out what other carbon thingies ol' Johnson made. This fork has carbon legs and an aluminum steerer tube. A full carbon fork is an option. Handlebar Bacchetta Aero Tweener - an open cockpit style handlebar designed for comfort and aerodynamics on long highway rides. These bars are more narrow than what comes on the Giro, for aerodynamics. We can retrofit wider bars if needed. Stem Bacchetta 3-Piece Adjustable - A rigid riser with no fore/aft adjustment. This gives a more solid feel and saves weight. Reach can be adjusted by switching parts or retrofitting a B-pivot riser. Front Derail Microshift R439 SS - A brand you've never heard of, but a good quality, long lasting front derailer. Cassette SRAM PG970 11-32t 9spd - A wide range, good quality freehub cassette. Front Brake Bacchetta Dual Pivot Road - A good quality road bike brake specially designed for recumbents, recognizing a challenge in routing cable to this kind of brake. Front Wheel Vuelta Corsa Lite 700c - A good quality road bike wheel set. Front Tire Kenda Kaliente L3R Pro - A decent road bike tire which will get you started. Consider an upgrade. Pedals Wellgo LU 897 Platform - Nothing great here, but bikes like this usually don't even come with pedals. They assume you'll be supplying your own preference. These pedals will get you going, but you'll want to upgrade. 24.5" - This is not absurdly high, even over those 700c wheels, but remember that the reclined position of the high racer means you'll need to sit upright in the seat to get your feet to the ground. This makes stops and starts more cumbersome. 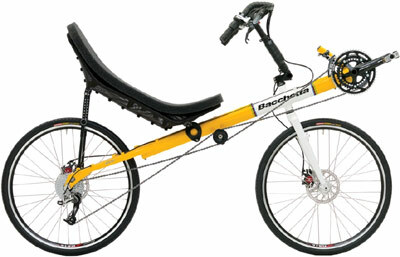 This lends the bike for fast, continuous rides on the highway, not so much for urban start/stop riding. Wheelbase Standard: 46", Large: 47" - This is the distance between the wheel hubs. Weight 25 lbs. w/Euromesh. - This is weight without pedals and with the Euromesh seat. The ReCurve seat adds about 1 pound. Gear Range 25-124" - Geared for speed. If you need lower gears they can be easily arranged. Color Pro Orange - Whatever that means. Frame Size Standard: 12.5" Boom - Large: 14" boom - This is not a very important metric. But if you are trying to determine what size frame you have then this is the easiest to measure. The "boom" is the part of the frame that runs from the headset (steering axis) out to the crankset. Measure from the middle of the head tube to the middle of the bottom bracket shell. X Seam Standard: 37"-46" - Large: 41"-50" - See our guide on how to measure your ex-seam.